Today was a very atypical day for the semiSerious Foodies: up early so Philip could take the Oath of Allegiance and become an American Citizen. So we joined with a friend who took us out to lunch at the Country Deli in Chatsworth. The serving sizes are very generous: whether you have the marinated skirt steak with eggs and home fries, or the Texas omelette it’s hard to finish the serve. While technically we didn’t pay for anything, it’s about $18 on average with tax and tip. In order to celebrate the new Citizenship, we had that most American of salads: Cobb. 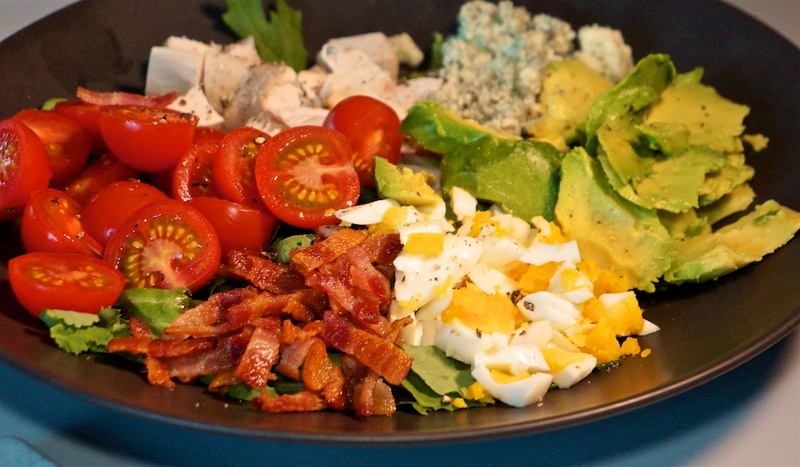 A Cobb Salad is almost entirely preparation as the only cooking required is to boil the eggs and fry off the bacon. It also leaves the ingredients themselves as the star. When there’s no fancy sauces, spices or flavoring – other than a mild dressing on the green leaves – each ingredient has to be superb. By choosing carefully, the basic Cobb can be elevated into a gourmet experience. The avocado is direct from a friend’s tree: a Fuerte instead of the more common Haas. I don’t know if it’s the breed, or the freshness, but this avocado was creamy and full of flavor. Normally about 50c per serve. Organic bacon is $8.99 for the pack, but it’s only two slices per serve, or $1.13 per serve. The cooked roast chicken was $7.99 but one quarter was used, or $1.00 per serve. The organic cherry tomatoes were $2.49 for the pack or $1.25 per serve. Dinner tonight was an example of how great a simple dish can be, when the ingredients are excellent. All up it cost $5.06 and was better than any Cobb Salad we’ve had in a restaurant. And never chop a Cobb Salad. That would be a crime against texture and flavor! We had another attempt at the Trader Joe’s Tarte à l’Oignon -Alsation style onion tart. We had a little more success in the regular oven, but it still didn’t firm up like we expected it to. The tart was $3.99 or $2.00 a serve. 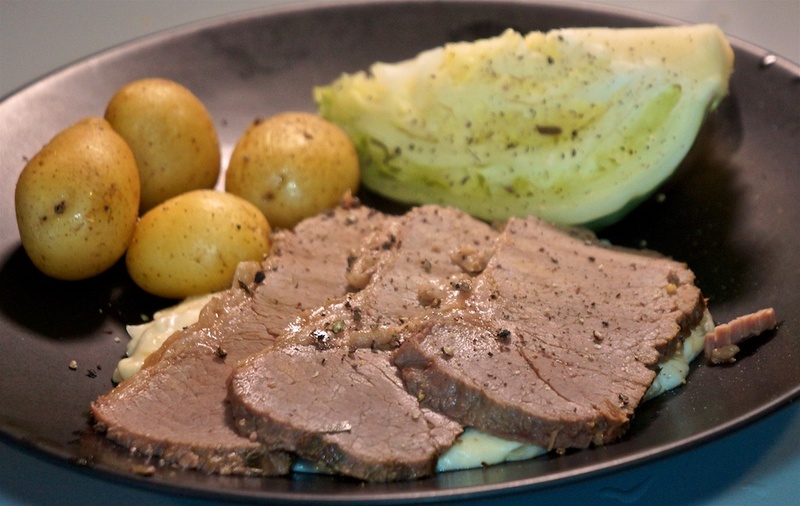 The challenge with the classic corned beef dinner is how to use the remaining corned beef. We’ve experimented with various Reuben sandwich ideas, but today we found the perfect solution: an oven-baked Reuben Casserole. Without a doubt this is the best use of corned beef and reuben sandwich ingredients. We loved it, despite foodie Greg’s dislike of “bread puddings” (including French Toast). 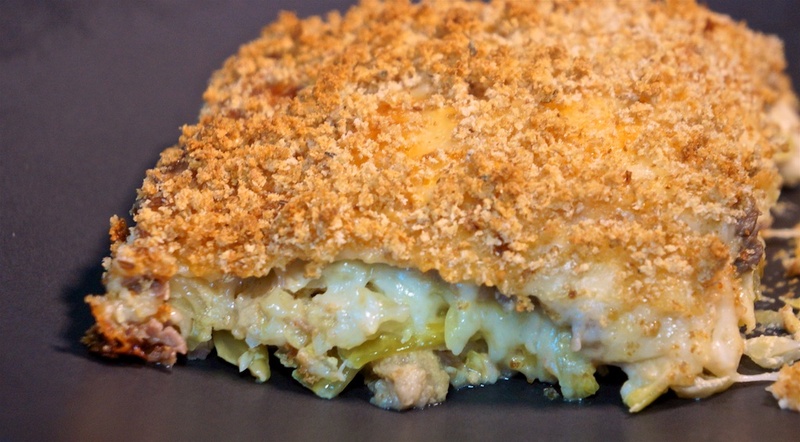 Technically a strata because of the layering, it embodies all that is good about a reuben, but better! The recipe makes six good size serves. Packaged, shredded Swiss Gryere $4.99 or 83c per serve. Although we used the full packet, it was probably closer to three cups than four. Dinner tonight cost $4.80 per serve and is way better than the traditional boiled meal. It turns out Trader Joe’s have just started stocking sliced corned beef, so we don’t have to prepare the whole 3 lb ! 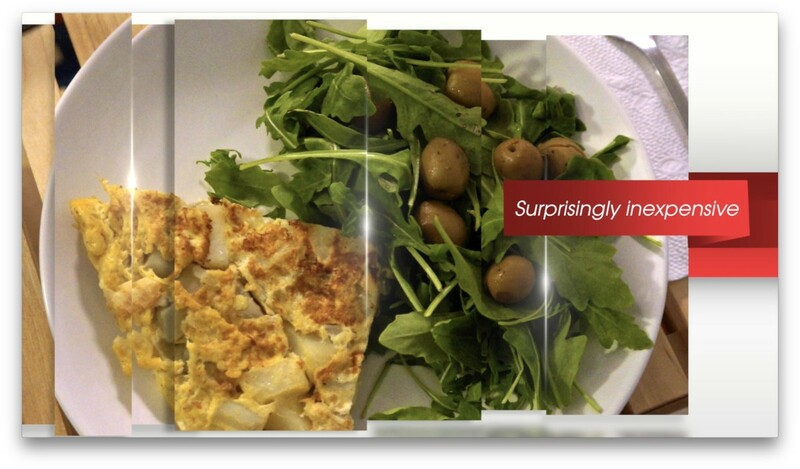 When we were in Barcelona last September, we discovered Spanish Tortilla, which is nothing like a Mexican Tortilla! After a little research, we put the tiny kitchen in our apartment to good use, proving you don’t need extravagant tools to cook anywhere, anytime. Monday being Burbank day for foodie Philip, it was again a Double Double from In and Out Burger. Double Burbank day as we met with a friend for drinks and dinner at Gordon Biersch in Burbank after buying a lounge from IKEA. Meal one was the 7 Oz. 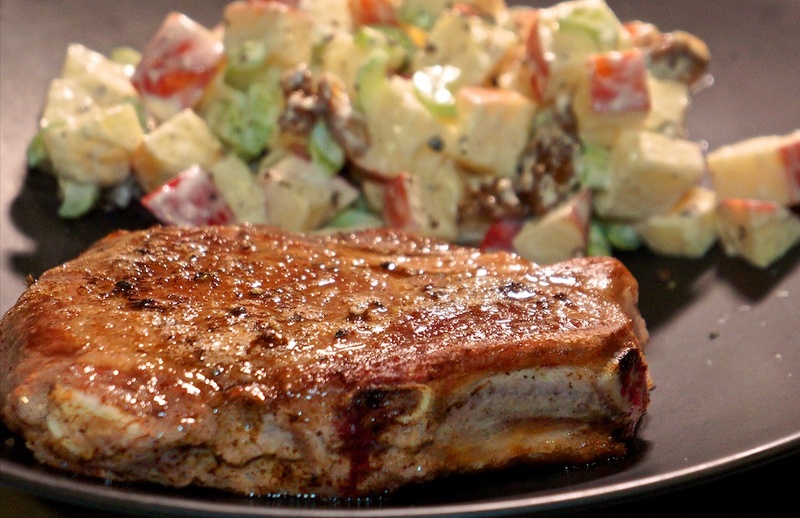 USDA Choice Sirloin Steak Frites with a menu price of $20.75 or $27.14 with tax and tip. Meal two was the Traditional Sausage Platter with a menu price of $15.99 or $20.91 with tax and tip. For the purpose of this blog, we’ll average the two for a cost per serve of $24.02. For lunch we decided to head for Jons up the freeway in Simi Valley to get one of their baguettes, cheddar cheese and liverwurst. 8 oz of cheese is $5.88 from Sprouts but we used around 1/4 or 74c per serve. It’s a tradition that we have corned beef, boiled potatoes and boiled cabbage for foodie Greg’s birthday, so that’s what we did. Dinner tonight cost us $7.87 for a very generous serve. An Everything bagel with wild caught smoked salmon and avocado. Lunch today cost $4.39 per serve. We last had cioppino on January 13. 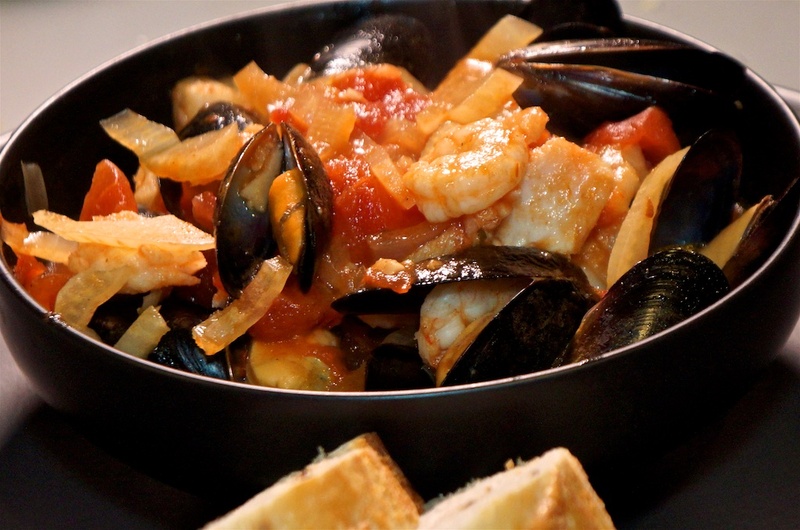 It’s a simple seafood stew that’s extremely tasty, but also very easy to make. We cooked the base and then added shrimp, mussels and cod for tonight’s meal. They were extracted from the stew and served with a generous amount of the broth. The balance of the broth mix will be used to cook up some more seafood later. For the firm fleshed fish, Greg used Kroger Wild Caught Pacific Cod. The 40 oz pack costs $16.89 but only 8 oz was used (two filets). $1.69 a serve. Dinner tonight cost $9.78 a serve with a very generous amount of broth left to cook up the next meal. This dish, when it was still on the menu at Gordon Birsch coast just over $20 with tax and tip, but they serve exactly three mussels and three shrimp. We had very, very much more than that! Foreboding rain and a relatively cold day had us turning to Trader Joe’s Steak and Ale pies for lunch. 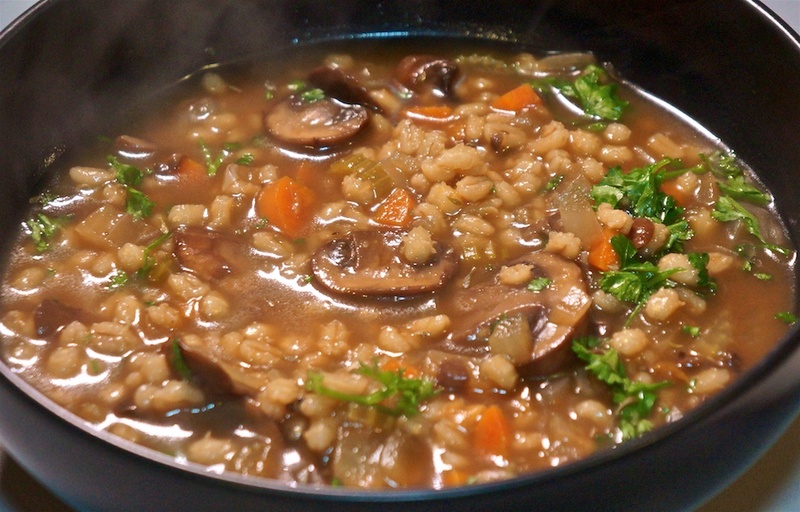 A hearty soup was what the weather indicated, so we decided on Mushroom Barley soup. We made a half batch and used all crimini mushrooms for four serves. Dinner tonight cost $3.01 per serve including the bread. Today we put together a quesadilla using actual tortilla’s instead of our usual flatbread. Lunch today cost $1.40 per serve. Once again, our Prather Ranch meat box included two bone-in pork chops, so once again we Sous Vide them before a final fry off in some butter for color and maillard flavors. Dinner tonight cost $12.85 for a serve twice the size of normal restaurant protein size, at a fraction of the cost of ordering in a restaurant. Feeling lazy today we heated a Trader Joe’s Tarte à l’mignon, or Alsatian Style Onion Tart. Following the reheat instructions in a convection oven rendered the result slightly undercooked. This is probably one of those times when a conventional oven heating from the bottom, will do the better job cooking. The tart was $3.99 or $2 a serve. Tonight’s dish is one we used to cook regularly, and then the supply of chile powder ran out! 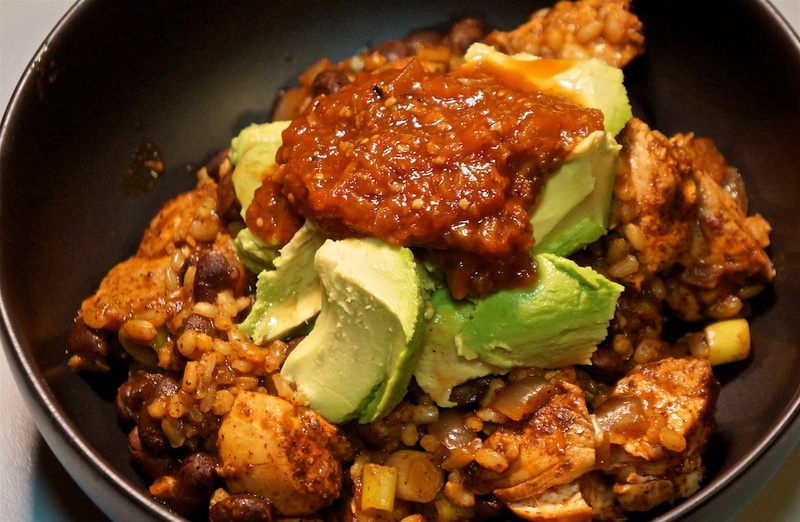 Red Chile Chicken and Rice with Black Beans packs a great fiber load. We skipped the green onions or cilantro, substituting avocado. The recipe makes four serves. It’s a good basic dish, but the addition of Rick Bayless’ All Natural fonder Gourmet Mexican Salso – Chipotle roasted tomatillo and garlic, adds a great kick, and the avocado adds a flavor and texture contrast. This time, the chicken tenders remained very tender because Greg barely fried them off, then let them steam over the dish for 10 minutes. They were just cooked, retaining all the tenderness the cut is known for. Dinner tonight cost us $4.69 a serve. For lunch today we finished baking a par-baked Multigrain Artisan loaf, halved it and filled with cheddar cheese and ‘pickles’ – in this case Wildbrine Fermented Madras Curry & Cauliflower Sauerkraut. Cheese and pickles is a very classic combination and the Wildbrine sauerkraut is an excellent pickle. Greg picked up the Multigrain bread on special for $2.50 or $1.25 per serve. Lunch today was a very generous portion for $3.26 per serve. Tonight we were invited to the Light Iron screening of Whisky Tango Foxtrot with panel discussion following. After the screening and panel, guests were invited to an Afghan banquet at Light Iron’s nearby facility. It was delicious and free. Thank you Light Iron.